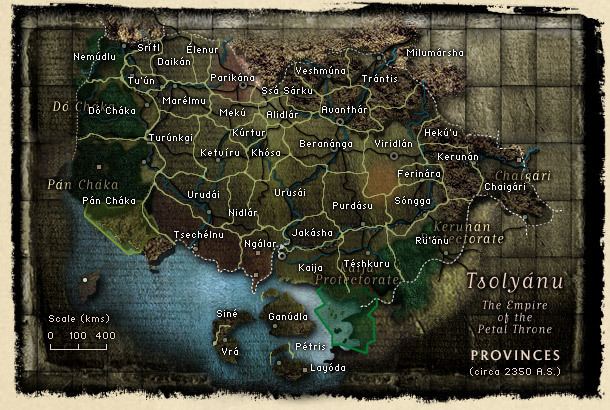 Tsolyánu—the Empire of the Petal Throne and traditionally the starting point for adventurers on Tékumel. The government of the Empire is a form of authoritarian bureaucracy. The power of the Emperor is absolute, served by the ever-vigilant eyes of the Omnipotent Azure Legion and its agents. As soon as a monarch dies all the royal heirs are summoned to Béy Sü for the Kólumejálim, the ‘Choosing of the Emperors’. There they undergo a traditional roster of tests designed to cover every facet of character thought to be needful for a ruler. The strongest contenders are taken at last within the sacred precincts of the Temple of Hnálla where the final selection is made according to ancient and secret ritual methods. Once an heir is chosen to ascend to the Petal Throne (reputedly a great seat of gray-green jade carved in the semblance of a delicate flower), he or she is immured in the Golden Tower at Avanthár for the rest of his or her life, unseen and unheard, but with the weight of divine authority behind every edict. Dó Cháka and Pán Cháka, to the west, changed back and forth in a long tug-of-war between Tsolyánu and Mu’ugalavyá, culminating in the Great War of 2,020 A.S. which ended in a stalemate. 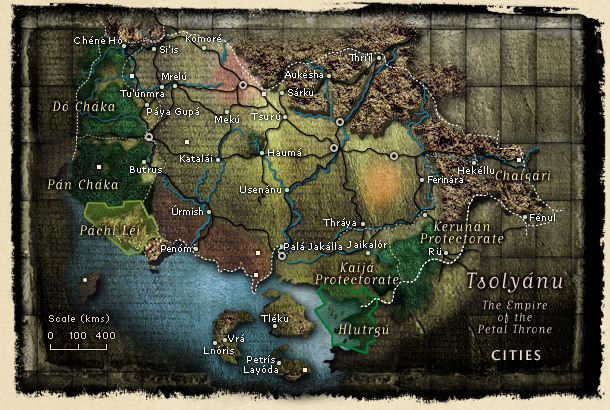 Much the same occurred in the east, where the Imperium vied with Salarvyá (and with the vicious Hlutrgú) for control of Káija, Kerunán and Chaigári. The Salarvyáni are too busy with their own interminable feuding, however, to offer much off a threat. Tsolyáni males average 1.68m in height, and are generally of slender-wiry or medium builds. Complexions range from coppery brown to a golden tan; noses are aquiline or straight; hair is fine and straight, always a glossy black; and there is relatively little body hair. Muscular, square-jawed and hawk-featured is the Tsolyáni male preference. Women are 1.57m in height on average with rather voluptuous figures; the common standard of female beauty is Tanulé, one of the Aspects of Avánthe, who is depicted as a slim girl with long black hair, triangular and piquant features, a retrousse nose and wide cheekbones. Curly or brown-streaked hair is considered unbeautiful, and light-coloured eyes are thought to be a sign of dishonesty. Tsolyáni have a predilection for elaborate ceremonial, visual display, and the security brought about by knowing exactly where one stands in the social order. The Tsolyáni pantheon is fully detailed in the Gods section. The other four Empires join in describing the Tsolyáni as arrogant, officious, and overrefined, a nation always striving to live up to the unattainable standard of its Engsvanyáli ancestors.